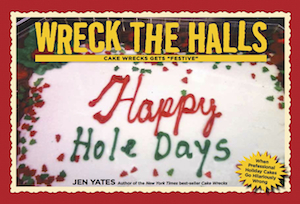 Cake Wrecks - Home - So, Where Ya Want It? So, Where Ya Want It? "Really, it's the only place that just made sense." So try to be specific! Use words like "in the middle" to avoid confusion. And you can't go wrong with directions like "over this" and "under that," right? I mean, when has that ever caused a problem? Oh! And if you're ordering a specific cake kit design, just use that as a reference. It does help if your baker knows what an "outfield" is. They... they just moved the hat. Well, dear minions, in the end you'll just have to trust that most of your inscription will probably end up on the cake somewhere. And then you can always send it to me. Thanks to Emily H., Sarah G., Kate L., Keren S., Tiffany B., Kellie, Mandy P., & Kristen Z., from the bottom of my post. Common! #5 says "under FKAT"
Yes, Jen. Let's celebrate in the middle. I'm so glad you're on it. As a passenger once said to me, as we were driving on a very icy road, "You're doing great! You're on it! you're all over it!" Um. FWIW, I was not all over the road. But these wreckerators are all over the... place. But what is "scheels" supposed to mean?!?!?!?!?!?! Borg, Scheel's is a chain of sporting goods stores, so I'm guessing this is for a store opening, or possibly for a baseball team sponsored by the store??? Did that last "happy birthday" just run over an armadillo? I can't even stop laughing at the top one. Oh how on earth are they still working at that bakery? Or getting a job there even lol. What is “Under Fkat Hilary”?